There’s no crying in baseball, or so says Tom Hanks in his delivery of the famous movie line. Under the right circumstances, yeah, there’s crying in hockey. 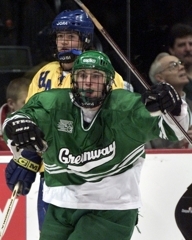 Greenway’s 2001 state tournament appearance might as well have been a weeklong bungee jump, with all of its emotional highs and lows. A small-school program (enrollment is less than 300) from the Iron Range, Greenway had opted up to play against the state’s largest programs in the Class 2A playoffs. The Raiders, featuring a large group of talented seniors, reached the state tournament by beating its three Section 7 opponents by a combined score of 17-3. “I remember when the clock was ticking down and Andy Sertich scored into an empty net with about 10 seconds left,” said Gino Guyer, a junior that season, about the Raiders’ 4-1 Section 7 title game victory over Cloquet at the Hibbing Memorial Building. “He rushed down the boards and skated away from everybody. Then the whole team came on the ice for the big pileup we had. Tears of joy flowed as the realization took hold: The Raiders were going to state! The Raiders were going to state! Of all teams, Greenway matched up against public school behemoth Eden Prairie (enrollment: 3,000-plus) in the opening round of the state tournament. With seemingly all of Coleraine and Taconite and the rest of the tiny towns that make up the amalgamation that is Greenway High School in attendance, the Raiders toppled the Eagles on an overtime goal by Guyer. It was just another clutch goal in a lifetime full of them for Guyer, the son of former Greenway head coach Pat Guyer. 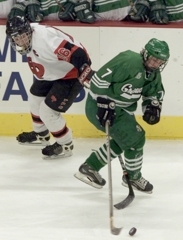 Named Mr. Hockey as a senior in 2002, Gino Guyer finished his career with 282 points (117 goals, 165 assists). 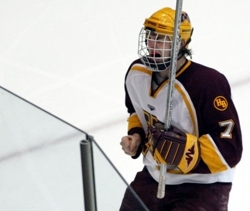 Only four high school players in state history (Little Falls’ Ben Hanowski, Red Wing’s Johnny Pohl, Duluth East’s Dave Spehar and St. Francis' Joey Benik) have higher point totals. “The thing that amazed me about Guyer was his size,” Moorhead coach Dave Morinville said about the 5-foot-10 Guyer. “You look at him and think, ‘Look at his size, we’ll just pound this kid.' He was very wiry guy. 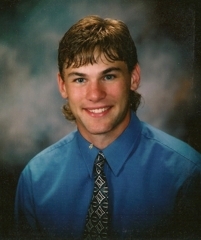 Moorhead matched up against Greenway in the 2001 semifinals, and the Raiders – surprisingly – were the heavy favorite. 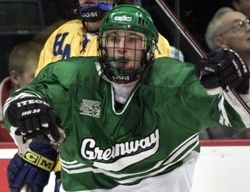 Greenway had pounded the Spuds during a regular season game in Coleraine. In the state tournament rematch, Greenway outshot Moorhead 28-14, but the Spuds prevailed 3-2 in overtime. The following night, emotions were raw in the Greenway locker room as the Raiders prepared to play Hastings for third place. “My dad tried to come in and give a speech before the game,” Gino Guyer said. “He couldn’t keep it together. There were 15 to 18 guys crying, and he was kind of stumbling through his words. 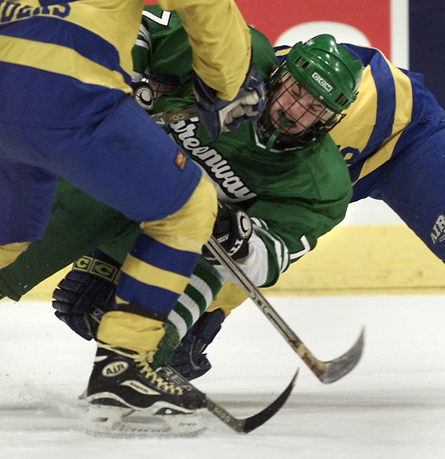 Greenway went out and beat Hastings 4-3 in yet another overtime game. Guyer assisted on senior Dan Mell’s winning goal. 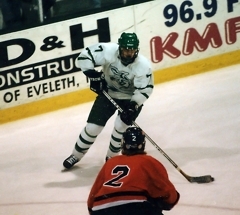 As a senior in 2001-02, Guyer scored 35 goals and added 50 assists in 26 games. 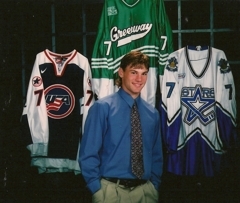 He went on to a national championship at the University of Minnesota in 2003 and is now playing professionally in Lillehammer, Norway. “I put his first pair of skates on him when he was 3,” Pat Guyer said. “He started out in the back yard skating around a cone.